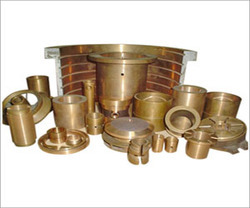 We are engaged in the manufacturing, wholesaling and exporting of an array of exceedingly high quality Ferrous and Non-Ferrous Metal Components. These products are known for their high grade raw material, which is sourced from tried and tested vendors of the market. Various sectors that demand our products includes industries like Pumps, Automobile, Marine, Compressor, Tractors, Construction Equipment and other Heavy Industries. The flawless range of Ferrous and Non Ferrous metal spares manufactured , wholesaled and exported in the market are known for their excellent operation, robustness, accurate dimensional qualities and reliability. Our company caters to customization of products according to clients' needs and specifications. We offer excellent packaging facilities for the products and make sure to adhere with strict delivery schedules.